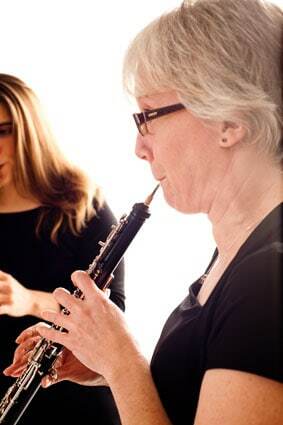 Oboist Katie Oprea, a member of Heliand Consort, will be performing at Brandon Music, April 18. Saturday, April 18 at 7:30 p.m. — BRANDON — Brandon Music proudly presents the Heliand Consort on Saturday, April 18 at 7:30 p.m. The Heliand Consort is a dynamic group of virtuoso musicians who perform engaging classical music, from the Baroque era through 20th century and contemporary repertoire. While the core ensemble consists of musicians on flute, oboe, clarinet, bassoon and piano, each season they appear in a variety of configurations, often with guest artists. The artists performing at Brandon Music include: Elisabeth LeBlanc, clarinet; Katie Oprea, oboe;and guest artists Sofia Hirsch, violin; Elizabeth Reid, viola; and John Dunlop, cello. This concert marks Heliand Consort’s first collaboration with strings in a program celebrating Romantic and neo-Romantic composers, including Benjamin Britten and Ottorino Respighi. Also featured is the oboe quartet by one of Australia’s luminaries, Padma Newsome, whose music has been performed by Heliand Consort on several occasions. Concert tickets are $15. Venue is BYOB. Brandon Music is located at 62 Country Club Rd. Brandon. For more info, call 802-247-4295.